Roderick Keegan was born in 1896 at Yulecart, the second son of John Keegan and Annie McInnes. 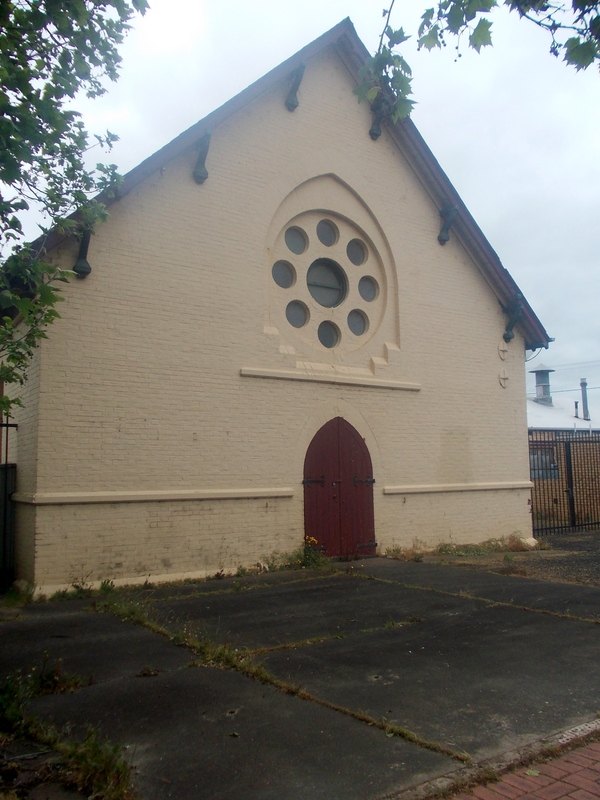 Known as Rod, he attended Yulecart School and possibly spent time at North Hamilton State School. While in Yulecart he lived with his grandfather Donald McInnes. At around fifteen, Roderick took up a coachbuilding apprenticeship with Reid & Price in Thompson Street. On 27 March 1916 aged nineteen, Rod enlisted at Hamilton and went off to camp with the 39th Battalion at Ballarat. By that time, his parents were living in Tyres Street, Hamilton. Home on leave, he was invited to a sendoff at Yulecart State School and from his employers Reid & Price, he was presented with an illuminated face wristwatch. Rod departed Australia for England on 27 May 1916. After training in England, the 39th Battalion left for France on 23 November 1916, arriving at Havre the following day. They made their way to Bailleul in the following days where they were billeted. Their first stint in the trenches was at Houplines in northern France from December 1916, spending Christmas Day in the trenches. 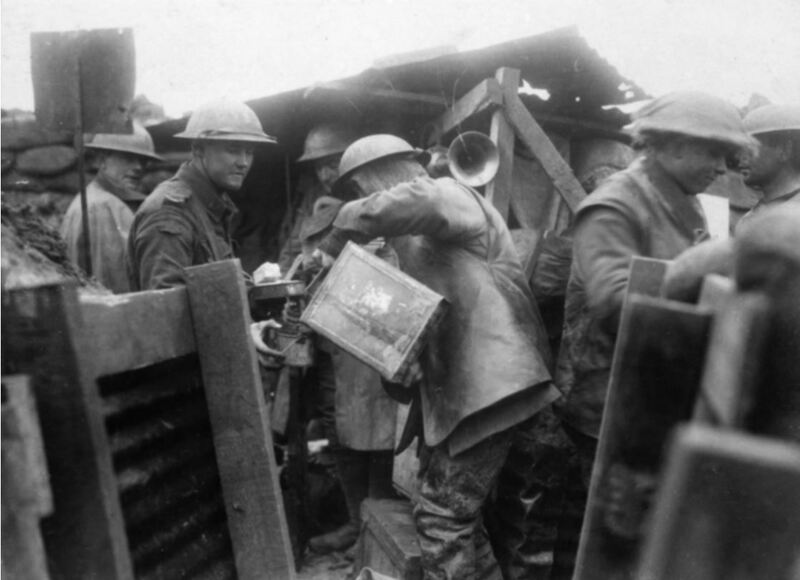 By June 1917, the 39th Battalion was at Ploegsteert Wood, Belgium in preparation for the Battle of Messines. On 7 June, as they marched to their starting point for the impending battle, the 39th Battalion was subjected to heavy gas shelling. More than two-thirds of the battalion was unable to take their place as the battle began. Rod Keegan was one of the victims of the gas and was hospitalised. News of Rod’s injuries reached home by July when the Hamilton Spectator published the news along with an excerpt from a letter Rod’s mother had received from a soldier in B Company with Rod. 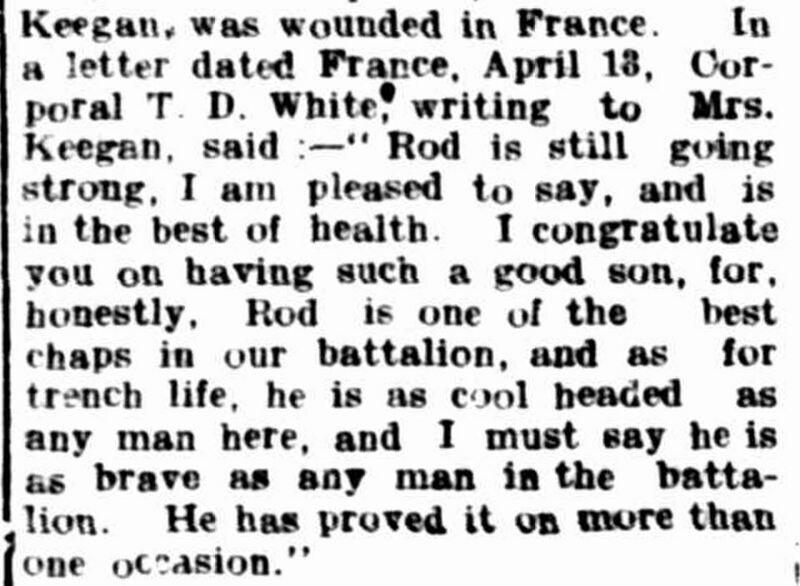 Thomas Douglas White wrote to Annie Keegan on 13 April, prior to Messines and reported on how well Rod was going. White hailed from Sebastopol and coincidently, his bravery on 7 June the day Rod was gassed, saw him awarded a Military Medal. “Hamilton Spectator” Hamilton Spectator (Vic. : 1870 – 1918) 6 July 1917: <http://nla.gov.au/nla.news-article119852809&gt;. Rod was discharged for duty on 14 June. During July, the battalion remained in Belgium and on were near Messines Ridge on 19 July when Rod fell ill and was admitted to hospital at Abbeville in France with pleurisy. On 26 July, he transferred to the 1st South African General Hospital with tuberculosis. With his condition worsening, Rod was transferred to the Royal Victorian Hospital at Netley, Hampshire, England on 16 August 1917. 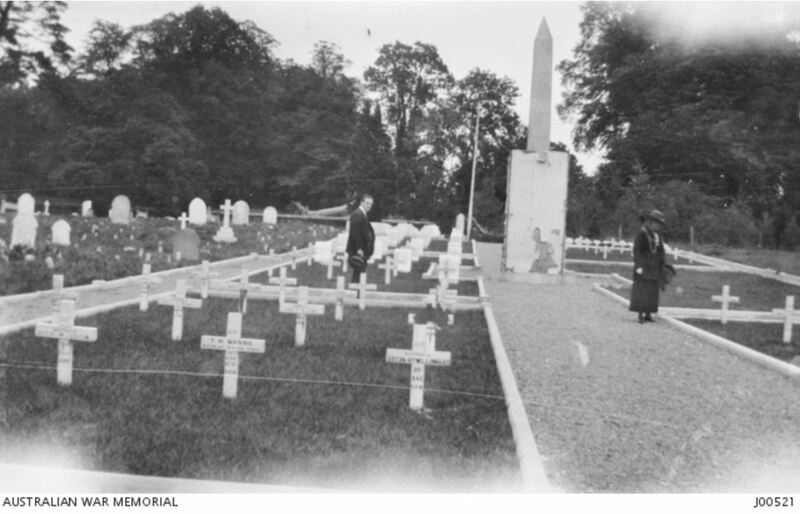 On 6 November he transferred to the Richmond Military Hospital near London and on 9 November, to the 1st Australian Auxiliary Hospital at Harefield, Middlesex. It was there Rod Keegan died at 7:05 pm on 20 November 1917 from exhaustion as a result of tuberculosis. By the end of November, John and Annie Keegan heard the news their son was dead. A notice was published in the Hamilton Spectator on 29 November 1917. “Advertising” Hamilton Spectator (Vic. : 1870 – 1918) 29 November 1917: <http://nla.gov.au/nla.news-article119859928&gt;. Despite them knowing he had severe tuberculosis, recent communications with Base Records had brought hope for John and Annie. On 5 October 1917, Base Records sent notification Rod’s condition had improved. On 27 October, Base Records reported Rod’s condition was “still improving”. Any hopes were soon dashed. 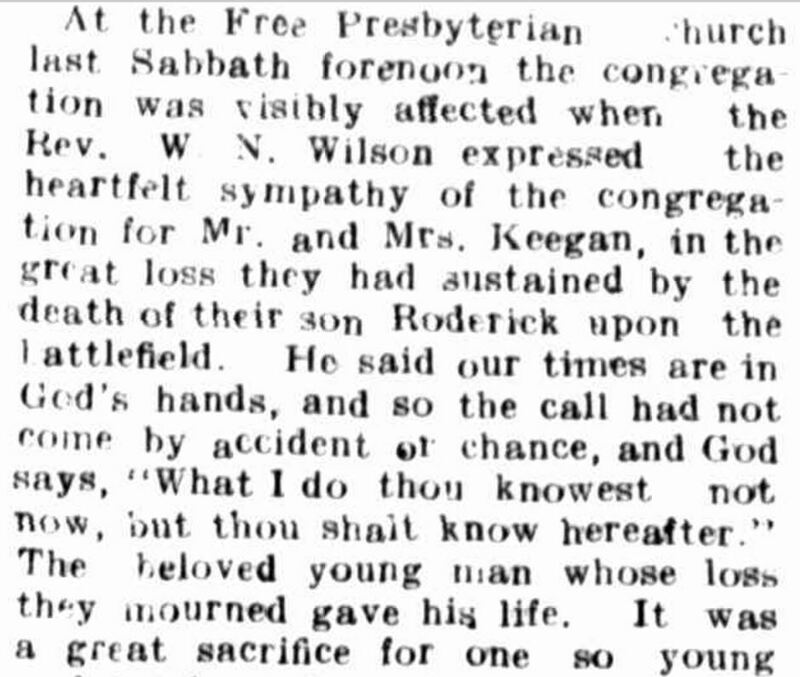 A memorial service was held for Rod at Hamilton’s Free Presbyterian Church on 2 December 1917. 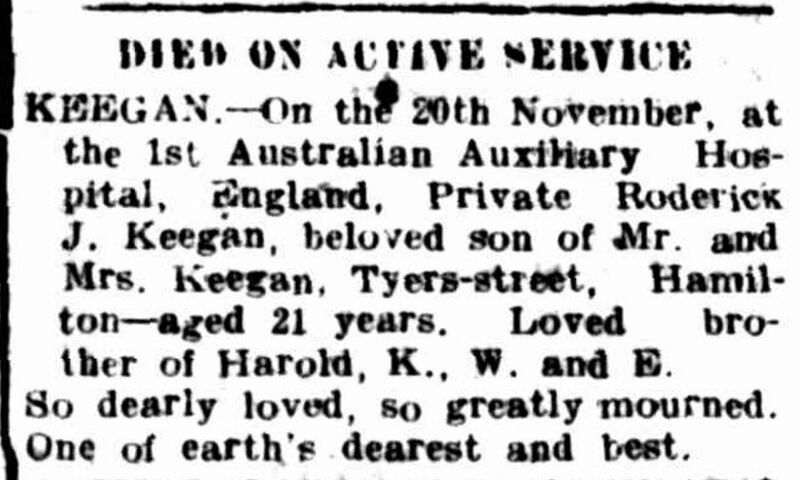 “THE LATE PRIVATE R. KEEGAN” Hamilton Spectator (Vic. : 1870 – 1918) 8 December 1917: <http://nla.gov.au/nla.news-article119860295&gt;. John and Annie Keegan remained in Hamilton, with John dying in 1941 aged seventy-one. Annie died on 20 January 1954 aged eighty-five, outliving her husband and four of her five children. Roderick Keegan is remembered on Hamilton’s War Memorial and the North Hamilton State School Honour Roll. A tree was planted for Roderick along Hamilton’s Anzac Avenue on 28 June 1918.